Fiji: still fighting for true democracy. In a week where the illegal leader would have New Zealand arresting 'terrorists', his own unelected government has produced two more unlawful decrees. They are the Fiji Constitutional Process (Constitution Commission) Decree 2012 and Fiji Constitutional Process (Constituent Assembly and Adoption of Constitution) Decree 2012. Both relate to the drafting of the new Constitution to replace the one Frank Bainimarama and Aiyaz Sayed Khaiyum illegally abrogated in 2009 to ensure their longevity. According to Khaiyum, the Constitution Commission decree will allow Section 8 of the Public Order Amendment Decree to be amended to allow what he says is the 'full participation of all Fiji citizens in the process', including political parties. Supposedly, no permits will be needed other than those for meetings held on public roads, in public parks or gardens and in sporting arenas and people can appear before the Constitution and say what they want without fear of reprisals. So if the decrees are so good, why then has the regime-appointed Constitution Commission gone public with its concerns? In a statement, the Commission says the Decrees give it and the public much greater clarity on the process being undertaken to formulate a new Constitution. But the Commission and its chair, Yash Ghai, go on to reveal that it is worried at how the regime continues to maintain control of the process, even as it professes to relax its grip. Here's what they say: ".... although the Constituent Assembly Decree lists some of the groups that will be represented in the CA (such as political parties, trade unions, women, the military, and civil society, etc), it gives the Prime Minister full control over the size and composition of the Constituent Assembly. "There is no indication of how many members will be drawn from each sector or what other sectors might be included. There is also no provision giving the groups that are to be represented a say in who should represent them in the Assembly. The Prime Minister will also appoint the Speaker of the Assembly. "These arrangements effectively mean that the essential principles of democracy are ignored and the independence of the Assembly is negated. In the light of the fact that members of the present government may wish to compete in the forthcoming elections, it is particularly important that they should not control the process that will, among other things, set out the rules for the elections. This will undermine the credibility of those elections." Ghai and the Commission are also right to be alarmed about Khaiyum's announcement that any any draft constitution must include immunity for the events that emanated back in 1987, the year Fiji had the first of its four military coups. Khaiyum says after the 2014 elections, no immunity will be given to members of the police or the military and that next year a Constituent Assembly will be established with Bainimarama to determine its members. The draft constitution is expected to go to the illegal President who will then pass it to a tribunal appointed by the chief justice with the tribunal checking the draft to ensure it is in line with the non-negotiable terms and the immunity provisions. Ghai and co again: ".... the Decrees require a broad immunity provision for the 2006 and earlier coups to be entrenched in the new constitution. "Among other things, the new constitution is to grant the same, broad immunity for actions up to the first meeting of a new Parliament to members of the government, administration and security forces as was granted by decree in 2010. "This type of prospective immunity is most unusual, perhaps unique, and, we believe, undesirable. The only exception is that the new constitution is not required to give immunity for common crimes (such as murder and assault) committed after the date of issue of these Decrees. "The Commission recognizes that immunity has been given in the past and that the immunity required in the new Constitution is similar to those immunities and it also understands that the issue of immunity must be considered in the process of transitioning to democracy. "However, we are concerned that the people of Fiji have not been consulted in any way on this important matter. "We believe that a better approach would be for the question of immunity to be part of the constitution-making process. "If immunity was part of the process, it could be discussed through submissions to the Commission and debate in the Constituent Assembly. Then a solution could be reached that citizens believe would promote the transition to democracy and contribute to a sustained democracy as envisaged in the Preamble to the Decrees." Ghai and his team have also noted the reality of how much freedom citizens really have, even with the promises of people being allowed to speak freely. "...although the temporary suspension of the requirement of permits for meetings is an important step forward, we are concerned that the current atmosphere in Fiji is not conducive to an open process in which Fijians can debate their future properly. "Controls over the media and the wide reaching powers of the security forces in this regard are particularly worrying, as is the fact that generally people have no redress for actions taken against them by the state because the right of access to the courts has been removed. "An important part of the process for constitution making should be the bringing together of all the people of Fiji to discuss freely, and agree on, the future of their country. "It should be an occasion for national reconciliation, acknowledging the violation of human rights and other abuses of power, and to commit the nation to a vision of Fiji based on democracy and respect for human rights, and a determination to overcome the divisions of the past." The regime has tried to reject the concerns of the Commission, just as Bainimarama has this week tried to blame 'cowards' for interfering with the supposed good work of his government. The truth is, as always, much simpler. Fiji citizens, like the Commission, would not fight something if it was genuine and to their benefit. That concerns continue to be raised, means there are doubts about motives and final outcomes. If the regime was less cowardly, it would accept this and quit manipulating the process. Joe Gonewai commented on Coup Fourpointfive's photo. Joe wrote: "If Ghai thinks that the issue is too hot for him to handle , then there is an exit door available....This issue is first to be discussed between the aggravating party rather than running quickly to the media to publicly announce their difference in opinion !! !....They are matured people and they should act like matured people...We don't hang our dirty laundry out where the public to see...They need to resolve this issue professionally and amicably bearing in mind the reservation, fear, suspicious of all the aggravating parties...Instead of diffusing our mistrust, this Constitutional commission is simply infuriating the stakeholders by publicly announcing their reservation via media before discussing with the Government...It is like a public spectacular popularity contestant....Come on Ghai this is not a Courtroom for favourable ruling from the Judge & Public...This government has gone through this system of public ridiculing for the last 6yrs and they are determine and resolved to carry out their Objective...even to the extent of postponing this process...So instead of amicably and professionally resolving this so that the process carried out according to the timetable the Government have given 2014 Election (hopefully) ..you are somehow threatening this Government ( Australia & NZ has failed to do this) for you public announcement without first discuss it with the State...So back to government etiquette procedure....."
Perhaps we shall see some integrity from Ghai after all? Or is it just a smokescreen and is he still supporting thugs with guns. Increasingly it would appear the junta is in a corner. Only the coup perpetrators and the facist fool groupies davis and walsh are left to defend the indefensible junta? It is time for davis and the fool from horowhenua to explain to us all why they support a human rights abusing junta that terrible deeds include jumping on pregnant women and bashing unarmed people to death. Why do they support these terrible acts? It is beyond evil. iarse has arrogated control of the constitution consultation process all to himself. In the decree it says the PM will have the final say on the composition of the assembly. But if you look deep and carefully you will see that iarse is the PM as bai is half the time out of the country and the acting goes to one person only. And even when bai is "in" iarse has effective control over the underschooled bai. dictators don't consult the people to do their dirty business. they don't need to. they rule by force. but naked force does not look nice in today's world so dictators have come up with new devises to rule. all the nonsense about Peoples' Charter, Constitutional Consultation, are part of this new ruse to rule - with a semblance of democratic pretense. The mistake many good people made in good faith is to go along with the ruling mob from the beginning. Never too late to say enough is enough. Government must return to the people,by the people and for the people. And not for the military thugs and their civilian cronies! It seems like immunity is being considered as of critical importance in this constitutional making which hints that this is surely what this constitution is all about, saving the skins of these goons from prosecution. There are a lot of issues at stake here that needs serious consideration like the murder and violence instituted against the people and property by this regime. How will there anguish and sufferings be adressed. The compensation of lawfully elected members of parliament removed by the regime. Remember the 2009 court ruled the coup as illegal which means the elected MPs have issues that needs addressing which brings in the issue of compensation. All those government employees illegally or forcefully had thier contracts terminated unlawfully by the regime, that needs adressing as well. Those who have suffered and lost their jobs as a result of the blow to the economy caused by the coup. This needs adressing too. There are host of other relevant issues that needs to be taking into account. I believe a holistic approach to ensure that all issues are taken care of is the establishment of a Truth and Reconciliation commission to hear all issues that are related or have emerged as a consequence of the 2006 coup. We need to do this first before the formulation of a constitution. I believe that is the way to go if we are to accomodate the concerns of everyone that have been affected by the coup. A good constitution can be formulated based on the findings of the commiccion. It seems like the military is only worried about protecting itself with the talk of immunity. What about those who died, tortured and lost their jobs as a consequence of the coup. Their case deserve to be considered as more important than that of the army. JGonewai should think about why the Commission is resorting to this strategy!I can see a humogous "I-C" why and it is what we would call INTERFERENCE-CONTROL...and which is strictly played according to a premeditated script! Just goes to show that the whole sorry exercise is a SHAM - was, is, always will be! There has never been any honesty let alone any sincerity from them (regime) from the start. So, the Commission is just another victim of the regime's lust for power and all that comes with it! To be used and abused and tossed aside when it no longer serves them any benefit...How can one have confidence that the country will at last move forward when all evidence points the other way! One is also not surprised at all by the regime's IMMUNITY demand. In fact, the demand is itself clear evidence of the regime's lack of belief and sincerity in what they have been doing these past six years. If they lack faith in their own rule, where does that leave the rest of us? If they were not COWARDS, they would willingly go to prison for their belief that what they did was in the best interest of the country. Giving immunity will only perpetuate the cycle of power usurpation and entrench even more Fiji's coup culture! We will be ever suspicious and hope that this is not some kind of ruse 'tiff' to send people running into the constitution commission consultation process and EVR after being duped into thinking that (maybe just maybe) Ghai & Co have their interests at heart. The regime is boxed into a tight corner as they have to now show evidence to the world that they have legitimacy and support in their proposed way forward. So the onus is now on them to produce numbers of people attending the constitution consultation process plus EVR numbers. As aid/donors & the UNDP are paying for this exercise they will want to see results. My punt is on their inability to meet their intended 600,000 registration mark even tho' they fluff up the numbers daily which I find still hard to believe. There is a notable dearth of images of these 'hoards' of people lining up to register or attend constitution consultations via the media or their own propaganda feeds. There are more folks lining up to purchase cellular phone credit, then there are those lining up to register to vote or consult on the constitution. Can't you see what Aiyaz, Nazhaat Shameem -mee and cp are doing tou the people of Fiji ? Answer: currently from you mouths..
Rai ki Beqa mate ga...immunity my arse! My relos were toutured, humiliated, treated like animals and killed by these thugs. Immunity to come in the form of Justice and fairness is the best! Remember the saying, It is nice to be important but it is more important to be nice. These poofters in green jackets and their shadowy advisors and their M16s were not nice to the people so tell me sara mada, WHY should we be nice to them? TRUTH must come out first, ACCOUNTABILITY second, ADMISSION OF GUILT third, TOUCH YOUR TOES fourth, immunity and free holiday for ever last at NABORO HOLIDAY resort. The Constitution Commission's public criticism of the regime's latest decrees is an indication of unresolved and growing antagonism. Contrary to Joe Gonewai's assertion, there is now no question but that the Commission has been sharing with ASK and probably others behind the scenes its concerns regarding regime actions undercutting the integrity and legitimacy of the process. I have chided Mr. Yash Ghai and the Commission for their seeming unwillingness to act to protect the process against regime manipulation, provocations, and bad faith dealings. I did so in the hope of spurring them to take appropriate action. It's now incumbent on me to give credit where it is due. This strong public expression of concern by Yash Ghai is appropriate action, and it undoubtedly follows numerous private intercessions with the regime leadership as well. The moment of truth is quickly approaching. That is the moment when Ghai et al must decide to invest no more of their reputations and prestige in a contrived process choreographed by Khaiyum to give a phony air of legitimacy to the regime's treason. The regime's latest decrees giving itself control over the selection of the Constituent Assembly and mandating the inclusion of an immunity clause in the new constitution come as no surprise to anyone but the regime's most naïve supporters. Both decrees are deal-breakers. Neither is negotiable. As Ghai notes, Bainimarama's control over the CA is undemocratic and negates its independence. Immunity has been given in the past and only led to more coups. The regime's continued heavyhanded suppression of countervailing viewpoints is more than even its most ardent apologists can support, so imagine how much more unacceptible they must be to constitutional experts seeking to manage a legitimate process of popular consultation and democratic decisionmaking. The regime badly wants Ghai's seal of approval, but in the end it will do anything to hold onto power. Ghai finally seems to be laying down the marker that his seal must be earned. Good for him. But the final showdown approaches. Like everyone else before him, Ghai needed to test the regime's sincerity. And like everyone else, he will soon understand for certain that the regime is acting in bad faith. That will be the moment of truth. As usual Daquwaqa talks sense. "The regime's continued heavyhanded suppression of countervailing viewpoints is more than even its most ardent apologists can support, so imagine how much more unacceptible they must be to constitutional experts seeking to manage a legitimate process of popular consultation and democratic decisionmaking. That will be the moment of truth." The moment is indeed nigh. 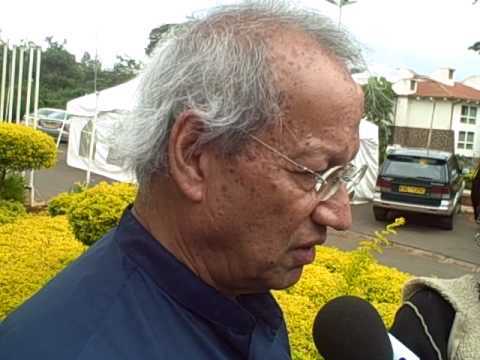 What you really mean is for Yash Ghai to toe the line like a good civil servant boy don't you? Yash ghai's commission is suppose to be an independent body acting to make a constitution which will serve in THE INTEREST OF THE PEOPLE OF FIJI - not the gang in power! Now get that into your head joe gonewai. We cannot afford a derailment of the democratic process through unintelligent use of the media by the Constitution Review Commission. Control is inbuilt in the military like their DNA. It's up to non-military types to summon and apply all their intellectual resources to communicate with the Military in a manner that will be of advantage to all. The AG should do the same. We all want to move forward and the CRC is not mandated to be a stumbling block in the process. Maybe it's time Joe Gonewai was Joe Goneaway. @DNA 8.29 - Your warped views would be good entertainment if it wasnt so infuriating! Seriously??? Definitely, we cannot afford a 'derailment of the democratic process' but the democratic process is anything but if it is not conducted in an environment of mutual good faith. Note that the key word here is MUTUAL. From where I'm standing, that is a concept that is foreign to this regime. It has always been 'my way or the high way' and nothing really has changed - the expectations and sacrifices all one way. From that perspective, the Constitution Review Commission like all others before it was never set up to succeed in the first place. So, DNA... the biggest stumbling block to the democratic process is the regime itself - lack of good faith, constant interference, control freaks are favourite weapons in their derailment arsenal! Unless and until the regime in particular its leadership is sincere and honest in their dealings, nothing moves forward and everything and everyone including the regime) is a stumbling block - mandated or not! DNA, the CRC's statements are necessary and timely to prevent the new constitution from becoming DOA, because what the regime is doing is totally undemocratic and cannot possibly give Fiji a legitimate government. So, the CRC was right to say something, and what it said was true and appropriate. Bainimarama doesn't want a democratic process. He wants a process that leaves him in power. Were he not so stupid, he could have engineered his own legitimate election three years ago, but instead he listened to the know-nothing advice of Khaiyum. The CRC is beginning to call the regime on its lies. The Commission will not be able to reconcile the regime's rhetoric of inclusiveness, transparency, etc, with the reality of its desire for full control. The entire process will then collapse, with Yash Ghai trundled off to the airport by a pack of goons while Khaiyum improvises a lie to discredit the Commission's efforts/intentions/integrity. That will be the sum of Ghai's recompense for putting any credence in Khaiyum. Khaiyum will keep prevaricating and improvising all the way to the end, with Bainimarama blithely following along. That end is coming faster than either of them imagines. It always does. If they were smart, they would leave for Abu Dhabi before the end of the month. But greed will hold them longer. Like monkeys grasping for nuts in a jar, they just can't let go. And so, in the end, we shall likely see the truth of the saying that a dictator always looks good until the last fifteen minutes. It promises to be quite a public spectacle. Well said, Dakuwaqa. Your earlier image of Samuel Doe again comes to mind. Ain't the way to go, DNA! lol. Meanwhile,friends and countrymen, more than 180,000 citizens have registered to vote as part of the big picture of the democratic process.The CRC is a part only of the whole of this big picture. There's no stopping the registration tide now as initiated by this regime particularly Aiyaz. Neither the CRC's departure nor naysayers can stop the road to democratic elections now. The will of the people will prevail.Let the best team for the people win. @DNA - You are more deluded than one first thought. 180,000 out of 600,000 eligible voters certainly is nothing to boast about. If only your arrogant megalomaniac Airyarse had left the CRC alone to do their job, there might be some hope for this so called democratic process. The way things are going now, you can forget about democratic elections. Then again, who said there was going to be any election anyway? The will of the people definitely will prevail in the end but not as you have envisaged unfortunately! By the way, with the departure of the CRC, whatever little credibility that was left will have gone and the regime will once again be revealed as the devil they really are!!! DNA, how is it working for Qorvis? Are the benefits good? When the CRC leaves, all credence in fair elections will go out the window. Stripped of its fig leaf, this phony election will be seen for the naked power play it is. At that point, time to take off the gloves. Investigating a murder plot against Bainimarama doesn't mean the New Zealand government supports him. It only means that it is serious about enforcing its own laws. DNA, had you stayed in school and finish Form 3, that number 180 000 out of the eligible 600 000 equates to 30%, or is that too hard for you to comprehend? You're just as dumb as Voceke. Your maths is in denial. 180,000 out of 600,000 is more than 25% in about a month with more than 12 months left till election deadline.You need a reality check and face the facts in your face.With special provisions for the handicapped to register, and 18year olds, credibility of the current regime is more than intact and with 3 women in the CRC there's hope for them yet. I note though there's no male indigenous member of the CRC. I wonder why ? You may have some answers. DNA, 180 000 out of 600 000 is exactly 30%. You said.... more than 25%..... that's an admittance that you can't even calculate the correct percentage dumbshit. Yeah right. Very clever of you. And what do you conclude from the 30% registration that begun on the 3rd of July - 19 days ago. I conclude that the success rate is absolutely brilliant.No wonder the NZ Govt now want to be seen backing Fiji. The real reason for the success rate off course is the generallly high level of education here which the current leaders being aware of therefore made the strategic decision to ensure action on the EVR. @DNA...the numbers or percentage is just one factor. What is more worrying is the heavy hand that the regime is exerting to a process that is supposed to be independent and free from interference and without which, there is absolutely no hope of holding a fair and free election. Your simplistic conclusion is therefore brilliant in its stupid logic!!! DNA, we cannot afford a derailment of the democratic process through unintelligent use of the media by traitors such as yourself. Lying seems to be inbuilt as part of your DNA. It's up to non-treasonous types to summon and apply all their intellectual resources to communicate with traitors like yourself in a manner that will be of advantage to all. Having failed that, you traitors should all go hang yourselves. Of course, the AG should do the same. We all want to move forward and treason is not mandated to be a stumbling block in the process. How dare you use my words - my intellectual property right. You should be jailed, Thief. DNA, isn't imitation supposed to be the sincerest form of flattery? No, in this case I suppose not, since your own words are used to mock you, and quite effectively. Theft of your intellectual property right? Since your comments are devoid of intellectual value, I see no crime of theft here. What I do see in your remarks, though, are the hallmarks of treason and stupidity -- the first a high crime but the second probably more a reflection of your poor education and weak DNA.